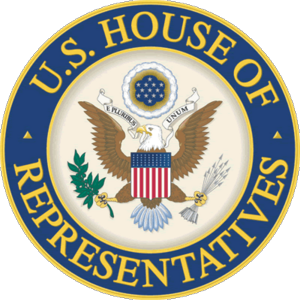 Seal of the United States House of Representatives. "House of Representatives" redirects here, for the Australian equivalent see Australian House of Representatives. The House of Representatives, often referred to as just "The House," is the lower chamber of Congress in which representatives of each state in the union gather. There are 435 voting members of the House, and each serves two year terms. Representatives can be re-elected an unlimited number of times, and indeed, most incumbents who seek re-election are continually successful. Every state has at least one Representative, and are allocated more based on population. For example, California has 53 Representatives. The House of Representatives meets in the United States Capitol in Washington, D.C. The House is the only part of the federal government in which a member must be elected by the people, and cannot be appointed to the position. The Origination Clause of the Constitution prohibit any revenue-raising bill from becoming law unless it originated in the House. The House's presiding officer is a Representative from the party with the most members currently in the House, and is known as the Speaker of the House. The current Speaker of the House is Dem Nancy Pelosi, who is from California. The majority leader is Steny Hoyer and the minority leader is Republican McCarthy. The Primary role of the House of Representatives is to originate legislation dealing with revenue and the budget, and to draft proposals for new laws to be reviewed by the Senate and the President. Numbers in brackets are non-voting members from US territories such as the District of Columbia and Puerto Rico. Chamber of the United States House of Representatives. Baker, Ross K. House and Senate, 3rd ed. New York: W. W. Norton. (2000). Lee, Frances and Bruce Oppenheimer. Sizing Up the Senate: The Unequal Consequences of Equal Representation. University of Chicago Press. (1999). Biographical Directory of the United States Congress, 1774-2005. 2005. biographical entries for every person who ever served; Biographical Directory online. This page was last modified on 9 April 2019, at 18:42. This page has been accessed 89,304 times.